What are they? Essential oils are derived from plants. The best analogy I’ve heard is to think of it as the “life-blood” of the plant – the oils protects the plant from insects, injury and disease. Because of those properties, essential oils are commonly used in natural healing. They date back to biblical days (remember how the wise men offered Jesus gifts of frankincense and myrrh) and have been used for thousands of years as a way to heal all sorts of ailments as well as to boost the immune system. How did I get started? I was introduced to essential oils a few years ago when I was given some as a gift. I started seeing great results and using them more; now I use them every day for all types of things. I have had a lot of side effects & bad reactions to medication in the past, so I am always looking for good alternative options. Essential oils, vitamins and nutrition have become my first line of defense when it comes to staying healthy. I have a cold air diffuser that fills my home with a great aroma, but gives emotional and health benefits as well. When I’m sick, I diffuse Thieves oil – it kills 99% of airborne germs within only 20 minutes. I create an at-home relaxing, spa environment by diffusing the Stress Away and Joy blends to improve my mood – aromatherapy really works! I apply the oils topically as well. I put oils on my feet as a quick way to reach my bloodstream or apply it directly to the affected area when I have a specific issue (stomach – nausea, chest – congestion, sinuses – stuffiness, back of neck or roof of mouth – headache, etc.). I always recommend adding a carrier oil, like coconut or olive, to a drop or two of oil to make it go further (even one drop can be very effective) and just in case you have sensitive skin. I swallow the oils for benefits as well. The combination of lavender, lemon & peppermint in a spoonful of honey or in an empty gel capsule are amazing for allergies/sinus issues. I use essential oils around the house all the time. Lemon or thieves in some distilled water is a great all-purpose cleaner and disinfectant. And I’ve used tea tree, thieves, geranium & eucalyptus to prevent fleas, mosquitoes and ticks on my dog. There is pretty much an essential oil for everything. I use lavender to help me fall asleep, to prevent breakouts and to relax. I put lemon in my water each morning to give me energy and to cleanse my digestive system. Peppermint helps with nausea, reduces fever, and relieves headaches. The Thieves blend is a fantastic immune booster and great for oral care. That’s just to name a few of my favorites; it’s easy to find ways to use them on Pinterest or all over the web. Where do I buy them? After experiencing some great benefits from the oils, I went to go buy more at the store. I quickly realized I wasn’t seeing the same effects even though it was the same oil. I started doing some research and realized the source/brand really does matter. If you are looking for a nice fragrance, you can find that pretty much anywhere. But if you are looking for health benefits, that’s much more rare. Essential oils must remain alive in order to promote healing. Many companies use heat or chemicals to extract the oils (because it’s cheaper), damaging and often killing the oil. Other companies add filler oils or fragrances to the bottle. Ultimately, they may smell the same, but they are not living and healing. I buy most of my oils from Young Living because they own the entire process from ‘Seed to Seal’ – they grow the plants on their own farms (pesticide-free), distill and bottle the oils themselves – so I trust the quality and safety of their brand. How can you get started? There are 3 different options that I detailed in this blog post. 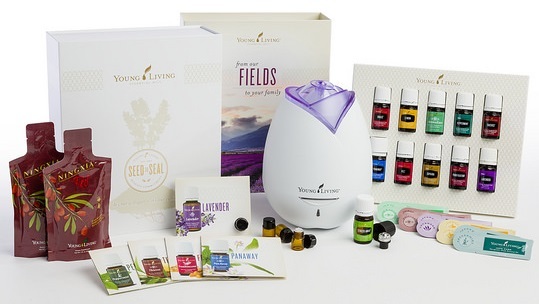 If you are interested in exploring essential oils, I recommend starting with a Premium Starter Kit from Young Living. This kit will give you 11 of the most widely used options, plus a diffuser. Plus, if you buy this kit and select the option to sign up to become a wholesale member, you can get 24% off retail pricing. If you just want to try out one or two oils, you can simply buy via the retail option on the website (you can always sign up for wholesale later). Visit this website to get started (Sponsor/Enroller # 2343919) and please let me know if you have any questions at all! Sign Up Here for a Wholesale Membership! Want to learn more? Check out my other blog posts where I write about how I use essential oils by visiting the Essential Oils menu on the top of this site. Disclaimer: These statements have not been evaluated by the Food & Drug Administration. I am not a doctor and any tips I share are not meant to diagnose or cure disease; I am just sharing ways that these oils have helped me personally.